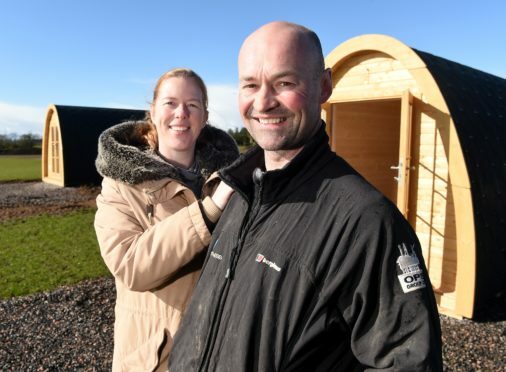 A husband and wife are to open a campsite with room for 60 pitches on the outskirts of Nairn – providing a tourism and economic boost to the area. Ewan and Truus McConachie have transformed part of their farmland into a brand new destination for travellers visiting the north. It is hoped the Barns Highlands Campsite will be a massive draw to visitors, encouraging those seeking to complete the ever popular North Coast 500 to venture east to the wonderfully rural setting of the Nairn suburbs. The self-confessed lovers of travel have invested nearly £250,000 into the transformation. They were awarded £100,000 from the EU-funded Leader Project for displaying diversity away from the farm business. Mr McConachie said: “We are the tenant farmers on Kinchyle Farm and have been since May 2017 when we took over from my uncle George. “Since then the farm has been transformed and tidied up from a pig farm to a very inviting, welcoming and environmentally friendly campsite. “Truus and I are keen campers and have been over the years. In fact, our camper van was actually our wedding car and honeymoon car, and we have always had a dream to open our own site, so all of this is quite exciting. “We were very fortunate to receive the Leader grant which has offered huge financial support, as without this it may have been a struggle. Mr McConnachie added: “It has been a very enjoyable project. Being hands on every day you get to enjoy the build and understand how everything comes together. The campsite owners claim the new facility is to cater for everyone, whether it be romantic getaways for couples, family holidays or to be used as a hub for the avid walker, fishing enthusiasts and bird spotters. Initially the venture is to be run by Mr and Mrs McConnachie. However, plans are in place for expansion to create more local jobs should the campsite prove to be a success. Yvonne White, chairwoman of Highland Leader’s Rural Enterprise Group said: “We were very impressed with the application from Barns Highland Ltd.